Objective The aim was to measure plasma l-carnitine concentration in healthy and septic neonates, and the relation between l-carnitine concentration and gestational age, birth weight, and presence of neonatal sepsis. Background Neonatal sepsis and endotoxemia result in impaired lipid metabolism and hepatic energy generation from fatty acid oxidation which could put those neonates at risk of l-carnitine deficiency. Materials and methods The study was carried out at the Menoufiya University Hospital over 1 year on 40 of healthy and septic neonates. All neonates were subjected to full history taking, clinical examination, and laboratory investigations included measurement of serum l-carnitine level, sepsis workup, and other laboratory investigations. Results Our study included 40 neonates, They were divided into four groups. Group 1: 10 healthy preterm neonates with a mean gestational age of between 33.50±1.18 weeks and mean birth weight of between 1.82±0.18 kg. Group 2: 10 healthy full-term neonates with a mean gestational age of between 38.80±1.03 weeks and mean birth weight of 2.98±0.23 kg. Group 3: 13 septic preterm neonates with a mean gestational age of between 33.46±1.13 weeks, and mean birth weight of 1.95±0.31 kg. Group 4: seven septic full-term neonates with a mean gestational age of between 38.57±1.27 weeks and mean birth weight of between 3.00±0.34 kg. Septic neonates groups (groups 3 and 4) have a low level of l-carnitine than healthy neonates groups (groups 1 2) and among septic groups the septic preterm neonates group (group 3) have a high level of l-carnitine than septic full-term neonates group (group 4). Also among healthy groups, the healthy preterm neonates group (group 1) have a high level of l-carnitine than healthy full-term neonates group (group 2). There was no correlation between l-carnitine and maternal age, gestational age, birth weight, and laboratory investigations in all groups. Conclusion There is a significant decrease of serum l-carnitine level in septic neonates, so they need assessment and supplementation. There is no correlation between serum level of l-carnitine and both gestational age and birth weight. Neonatal sepsis is a systemic infection occurring in infants at less than or equal to 28 days of life and sepsis still contributes significantly to mortality and morbidity among very low birth weight (<1500 g) infants in Neonatal Intensive Care Units (NICUs) . Early-onset neonatal sepsis has been variably defined based on the age at onset, with bacteremia or bacterial meningitis occurring at less than or equal to 72 h in infants hospitalized in the NICU, versus less than 7 days in term infants . In preterm infants, early-onset neonatal sepsis is most consistently defined as occurring in the first 3 days of life and is caused by bacterial pathogens transmitted vertically from mother to infant before or during delivery . Late-onset sepsis is sepsis occurring after 72 h in NICU infants and 7 days of life in term infants, and has been variably defined as occurring up to the age of more than 90 or 120 days . Neonatal sepsis is a significant cause of morbidity and mortality of hospitalized newborns and premature infants. Worldwide, sepsis accounts for 15% of neonatal deaths . Neonatal sepsis is clinically diagnosed by a combination of clinical signs, nonspecific laboratory tests, and microbiologically confirmed by detection of bacteria in blood by culture . The early stage of sepsis development: the main symptoms of it are from a decrease in systemic vascular resistance due to vasodilation. The late stage of sepsis development is caused from the body being unable to meet the oxygen demands of tissues. Tissue damage and lactic acidosis can occur, and this is now a hypovolemic state . Carnitine is an amino acid derivative which is synthesized endogenously from the essential amino acids lysine and methionine . Carnitine is stored mainly in muscles. Carnitine has an important role in facilitating medium-chain and long-chain fatty acid transport from the cytosol into the mitochondria for β-oxidation and energy generation. In addition, carnitine stimulates pyruvate dehydrogenase complex activity and the Krebs cycle, increasing branched-chain amino acid oxidation in muscles . Sepsis and endotoxemia result in impaired lipid metabolism and hepatic energy generation from fatty acid oxidation , which could put infants at risk of l-carnitine deficiency. A longitudinal study was carried out at Menoufiya University Hospital and Nursery of Shebin El-Kom Teaching Hospital. Over a period of 1 year from January 2017 to January 2018. The study protocol was approved by the local ethics committee of the Menoufiya University and written consent was obtained from the parents. The study done on 40 neonates (20 healthy neonates is divided to 10 preterm and 10 fullterm) and 20 cases of neonatal sepsis is divided to (13 preterm and seven fullterm). History of any medical diseases such as diabetes mellitus or hypertension before and/or during pregnancy. History of intake of any medication during pregnancy. Date of the last menstrual period, and cause of prematurity in case of preterm newborns. Attendance of neonatal resuscitation, evaluation, and decisions regarding the resuscitation measures guided by assessment of respiration, heart rate, and color/oxygen saturation. Apgar score at 1, 5, and 10 min were recorded after birth. Clinical examination and application of clinical sepsis score. Complete blood count with differential leukocytic count(application of hematological sepsis score). Blood culture (for infants with positive hematological sepsis score). Other laboratory investigations such as blood glucose level, hemoglobin level, and platelet level. Measuring serum l-carnitine using an enzymatic ultraviolet test by peripheral venous samples were collected from healthy groups, also from septic groups (after diagnosis of sepsis clinically and by laboratory investigations). Data were collected, coded, revised, and entered into the Statistical Package for the Social Sciences (IBM SPSS) version 20 (IBM Corp. Released 2010, IBM SPSS Statistics for widows,version 20.0, Armonk, NY: IBM Corp). The data were presented as number and percentages for the qualitative data, mean, SD, and ranges for the quantitative data with parametric distribution and median with interquartile range for the quantitative data with nonparametric distribution. χ2-Test was used in the comparison between two groups with qualitative data and Fisher’s exact test was used instead of the χ2-test when the expected count in any cell was found to be less than 5. Spearman’s correlation coefficients were used to assess the significant relation between two quantitative parameters in the same group. (1) P value greater than 0.05: nonsignificant. (2) P value less than 0.05: significant. (3) P value less than 0.01: highly significant. Our study included 40 neonates and they were divided into four groups. Group 1: 10 healthy preterm neonates with a mean gestational age of between 33.50±1.18 weeks and mean birth weight of between 1.82±0.18 kg. Group 2: 10 healthy full-term neonates with a mean gestational age of between (38.80±1.03 weeks) and mean birth weight of 2.98±0.23 kg. Group 3: 13 septic preterm neonates with a mean gestational age of between 33.46±1.13 weeks and a mean birth weight of 1.95±0.31 kg. Group 4: seven septic full-term neonates with a mean gestational age of between 38.57±1.27 weeks) and a mean birth weight of between 3.00±0.34 kg. Septic neonate groups (groups 3 and 4) have a low level of l-carnitine than healthy neonate groups (groups 1 and 2) and among septic groups the septic preterm neonate groups (group 3) have a high level of l-carnitine than the septic full-term neonate groups (group 4). Also among healthy groups, the healthy preterm neonates group (group 1) has a high level of l-carnitine than healthy full-term neonate groups (group 2). There was no correlation between l-carnitine and maternal age, gestational age, birth weight, and laboratory investigations in all groups. Our study included 40 neonates. [Table 1] shows that there was significant decrease in weight and gestational age in the septic group in comparison to the healthy group, which comes in accordance with Gardner et al. who found that the incidence of neonatal infection is higher for infants with lower gestational age, with premature infants having a three to five times greater risk of developing sepsis. Among group 1, the incidence of causes of prematurity ([Table 2]) was idiopathic preterm labor in 40%, premature rupture of membrane in 10%, antepartum hemorrhage in 10%, and maternal disorders represent 40%. The high percentage of maternal disorders is in agreement with the study done by Hammond et al. , which detect changes in risk factors for preterm birth in Western Australia in the period 1984–2006. Over the 23 years of study, there was a fourfold increase in the rates of preexisting medical maternal complications over time, and the estimates for premature rupture of membrane (PROM) were between 10 and 20% . 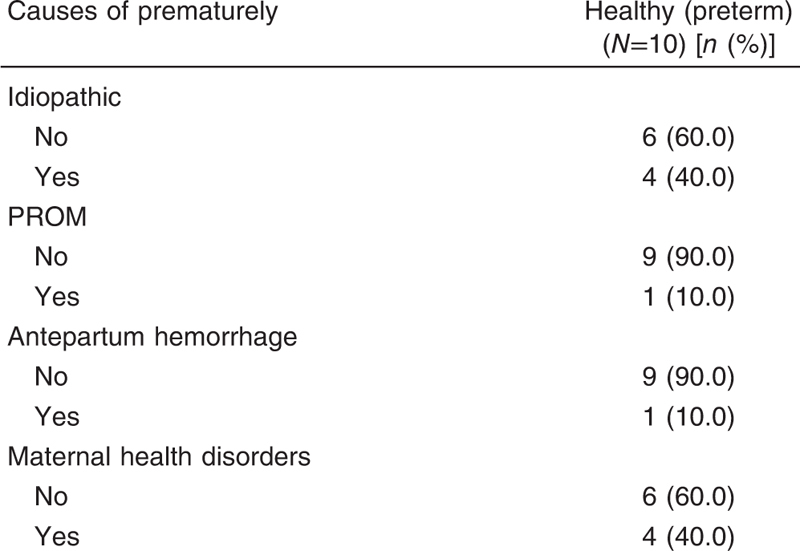 Among group 3, the incidence of causes of prematurity ([Table 3]) were: idiopathic cause in 30.8%, PROM in 53.8%, antepartum hemorrhage in 7.7%, and maternal disorders in 7.7%; the high percentage of PROM comes in accordance with the study done by Yang et al. on 73 patients. In 33 (45.2%) patients, amniotic membranes ruptured before 23 weeks of gestation. All healthy groups show negative CRP; however, all septic groups show positive CRP ([Table 4]), which agree with the study of Omran et al. on 70 neonates, 35 with sepsis and 35 healthy controls. All the septic cases were positive CRP and was stated that, to date, CRP is the most extensively studied acute-phase reactant, despite the detection of new markers of infection, with wide-ranging sensitivities and specificities (74–98% and 71–94%, respectively). 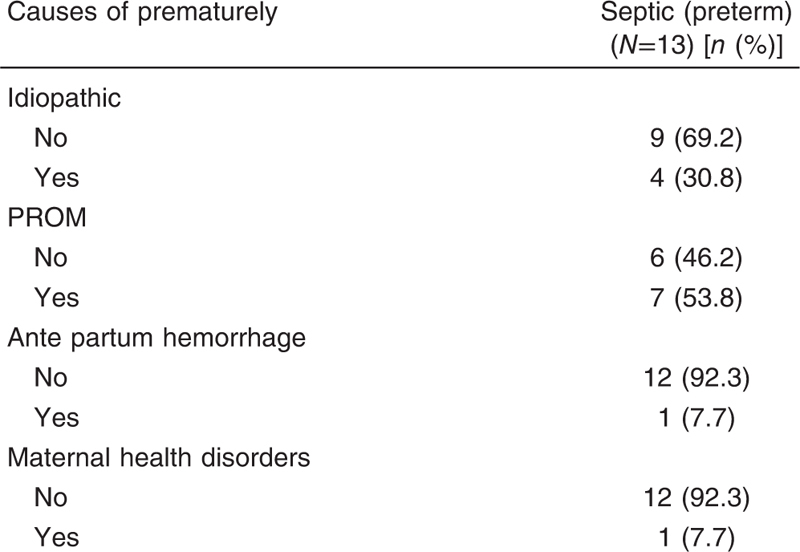 The l-carnitine level in septic preterm neonates was more than septic full-term neonates ([Table 4]), which agree with the study of Chace et al. which report that no meaningful correlation was found between total carnitine and gestational age or birth weight in any group. All septic cases of our study were of positive blood culture and regarding the type of blood culture. [Table 5] shows that the percentage of Gram-negative organisms in blood culture is 71.4% in septic full-term and 69.2% in septic preterm; however, Gram-positive organisms represent 28.6% in septic full-term and 23.1% in septic preterm and fungal organisms represent only 7.7% in septic preterm which agree with the studies done by Ozkan  and Lim  which reported that Gram-negative organisms as the most frequent microorganism. [Table 6] and [Figure 1] report that there was significant increase in serum l-carnitine (mg/l) in the healthy group in comparison to the septic group. 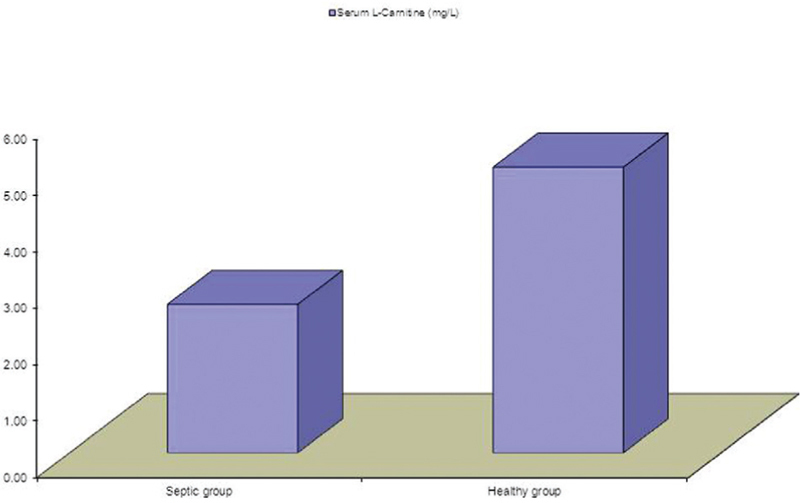 Figure 1 Serum l-carnitine regarding septic group and healthy group. The serum l-carnitine (mg/l) in the healthy group was 5.06±1.03 mg/l and serum l-carnitine (mg/l) in the septic group was 2.63±0.35 mg/l. Hatamkhani et al. report that it seems reasonable not to consider carnitine as a mandatory and beneficial supplement under septic conditions. 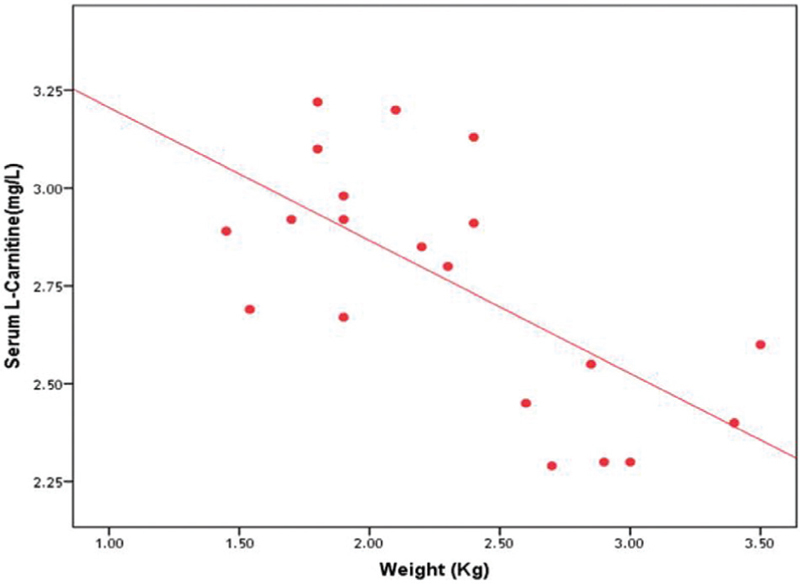 There is no correlation between l-carnitine level and birth weight and gestational age among all studied groups which is opposite to the study done by Sánchez-Pintos et al. , which report that l-carnitine deficiency was demonstrated in all very low birth weight babies. However, birth weight restriction has been suggested as a risk factor for impaired carnitine status ([Table 7] and [Figure 2]). Figure 2 Weight regarding serum l-carnitine. There is a significant decrease of serum l-carnitine level in septic neonates, so they need assessment and supplementation. 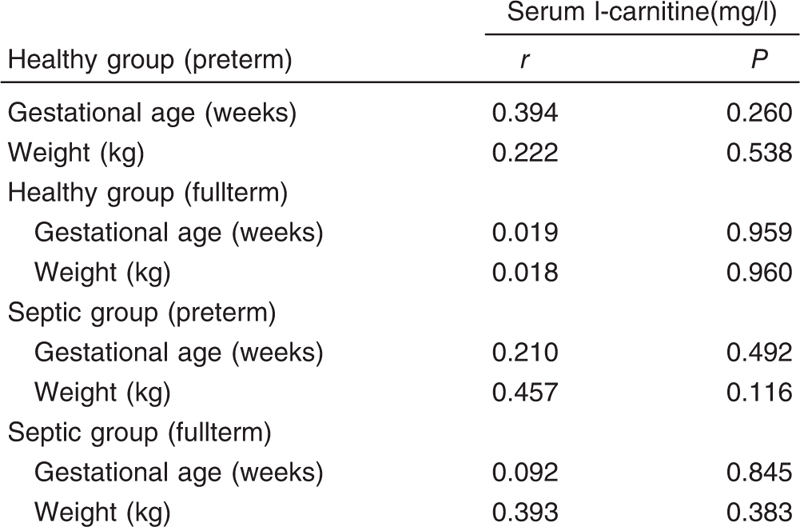 There is no correlation between serum level of l-carnitine and both gestational age and birth weight. There are conflicts of interest. Shah BA, Padbury JF. Neonatal sepsis: an old problem with new insights. Virulence 2014; 5:170–178. Edwards MS, Gonik B. Preventing the broad spectrum of perinatal morbidity and mortality through group B streptococcal vaccination. Vaccine 2012; 31:D66–D71. Hornik CP, Fort P, Clark RH, Watt K, Benjamin DK Jr, Smith PB et al. Early and late onset sepsis in very-low-birth-weight infants from a large group of neonatal intensive care units. Early Hum Dev 2012; 88: S69–S74. Bauserman MS, Smith PB, Clark RH, Cohen-Wolkowiez M, Engmann C, Laughon MM et al. Group B Streptococcus and Escherichia coli infections in the intensive care nursery in the era of intrapartum antibiotic prophylaxis. Pediatr Infect Dis J 2013; 32:208–212. Unicef. Neonatal mortality. Available at: http://data.unicef.org/child-mortality/neonatal [Accessed May 2015]. Marchant EA, Guilaine EB, Sadarangani M, Lavoie PM. Neonatal sepsis due to coagulase negative staphylococci − Clinical and Developmental Immunology Journal, 22 May 2013. 586076. doi:101155/2013/586076. Epub 2013 May 22. Gardner SL, Carter BS, Enzman-Hines M, Hernandez J. Merenstein & Gardner’s handbook of neonatal intensive care. 8th ed. St. Louis, MO: Mosby Elsevier 2015. Eaton S, Pierro A. Carnitine and fatty acid oxidation in sepsis. Monatshefte Chemie/Chem Monthly J 2005; 136:1483–1492. Xi L, Brown K, Woodworth J, Shim K, Johnson B, Odle J. Maternal dietary l-carnitine supplementation influences fetal carnitine status and stimulates carnitine palmitoyltransferase and pyruvate dehydrogenase complex activities in swine. J Nutr 2008; 138:2356–2362. Gallo LL, Tian Y, Orfalian Z, Fiskum G. Amelioration of popolysaccharide-induced sepsis in rats by free and esterified carnitine. Mediators Inflamm 1993; 2:S51–S56. Hammond G, Langridge A, Leonard H, Hagan R, Jacoby P, DeKlerk N et al. Changes in risk factors for preterm birth in Western Australia 1984-2006. Int J Obstet Gynaecol 2013; 120:1051–1060. Yang LC, Taylor DR, Kaufman HH, Hume R, Calhoun B. Maternal and fetal outcomes of preterm premature rupture of membranes. J Am Osteopath Assoc 2004; 104:537–542. Omran A, Maaroof A, Saleh MH, Abdelwahab A. Salivary C-reactive protein, mean platelet volume and neutrophil lymphocyte ratio as diagnostic markers for neonatal sepsis. J Pediatr (Rio J) 2018; 94:82–87. Chace DH, Pons R, Naylor EW, Tein I, Darryl CA. Neonatal Blood Carnitine Concentrations International Pediatric Research Foundation Inc. 1 May 2003; Vol 53:823–829. Ozkan H, Cetinkaya M, Koksal N, Celebi S, Hacimustafaoglu M. Culture-proven neonatal sepsis in preterm infants in a neonatal intensive care unit over a 7 year period: coagulase-negative Staphylococcus as the predominant pathogen. Pediatr Int 2014; 56:60–66. Lim WH, Lien R, Huang YC, Chiang MC, Fu RH, Chu SM et al. Prevalence and pathogen distribution of neonatal sepsis among very-low-birth-weight infants. Pediatr Neonatol 2012; 53:228–234. Hatamkhani S, Karimzadeh I, Elyasi S, Farsaei S, Khalili H. Carnitine and sepsis. J Pharm Pharm Sci 2013; 16:414–423. Sánchez-Pintos P, Pérez-Muñuzuri A, Cocho JA, Fernández-Lorenzo JR, Fraga JM, Couce ML. Evaluation of carnitine deficit in very low birth weight preterm newborns small for their gestational age. J Matern Fetal Neonatal Med 2016; 29:933–937.